This month´s meeting was at Jolene´s home. She provided us with excellent appetizers including a wonderful cheese and ham pastry. We had almost full attendance this month, Beth, Betty, Carla, Colette, Janet, Joan, Jolene, Linda, Michèle and Shirley. 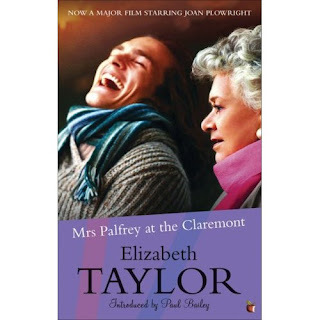 Our book choice this month is Beth´s, Mrs. Palfrey at the Claremont by Elizabeth Taylor. Beth informed us that the author Elizabeth Taylor was one of several British authors, well known in the 1950´s to 1970´s who wrote about women´s lives. Ms. Taylor was not a sentimental writer but rather wrote with considerable detail about everyday challenges in women´s lives. Beth compared this book to Margaret Laurence´s The Stone Angel. The subject matter is about coping with ageing and the limited options as we grow old. The subject matter had all of us thinking of our own mothers and their situations. Janet mentionned the movie The Curious case of Benjamin Button that begins with the main character being old and depicts the limited options that he has because of age. All liked the book, however many found the subject matter depressing. There was however considerable discussion and comparison of our own parents´ situation and of our own futures. We also discussed the differences between the book and the movie that most of us saw. Jolene installed the DVD on her new large screen and we were able to watch one scene in particular, that is the first evening meal, that set the tone for the atmosphere at the Claremont Hotel. Jolene noted that the author seems to have inserted herself in the novel on page 136 of the paperback version when Mrs. Palfrey talks to ¨Miss Taylor¨ at the Library. We all agreed that this was a good choice and thanked Beth. Our next meeting is on Monday May 25 at Linda´s home and the book choice is Shirley´s Those who Save Us by Jenna Blum.